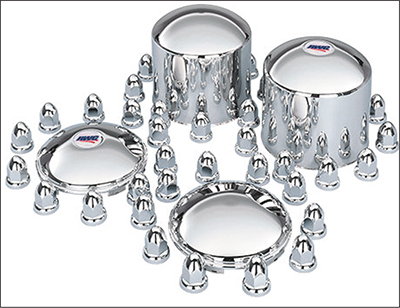 Chicago-based RealWheels fabricates various decorative, yet functional, automotive parts. 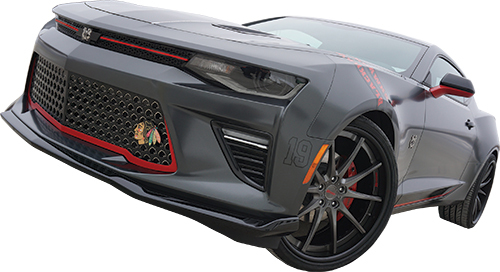 Thanks to the addition of a fiber-laser cutting machine, the company has upped productivity significantly on these parts, including grille covers for limited-edition Chicago Blackhawks Camaros. The saying goes, “If you bought it, a truck brought it.” True enough, as trucking moves America—80 percent of all U.S. goods are transported via this vital transportation mode. With the growing economy, the purchase of products will continue to rise, in turn creating more jobs for the trucking industry. In fact, the Bureau of Labor Statistics shows a 21-percent growth in the segment through 2020. This forecast is great news for Chicago, IL-based RealWheels Corp., which has been designing and producing stainless-steel wheel and axle covers, grills, billet aluminum door handles, billet pedals, and other accessories for commercial trucks and specialty vehicles for nearly 40 years. While competitors have turned to China to cut costs, RealWheels reportedly remains the only American manufacturer of these wheel accessories, relying on employee dedication, innovation, efficiency and quality to remain competitive. RealWheels new fiber-laser cutting machine fabricates a grille cover for the Blackhawks Camaro. RealWheels now uses the new machine for 85 percent of its products. RealWheels traces its roots to 1978, when Jan Polka, the company’s founder and president, decided to dress up the cast spoke wheels on his Kenworth commercial truck. He grabbed some sheetmetal and headed to a shop to cut, form and chrome mag-wheel covers. These updated wheels were such an improvement that other truckers started asking where he got them. Shortly after fabricating that first set, Jan and his wife, Sherri, started RealWheels, manufacturing wheel covers out of their garage. Demand continued to grow and so did the company. Today RealWheels operates in a 40,000-sq.-ft. facility in Gurnee, IL, with a team of 60 employees that includes the Polka’s two sons, Cory, plant manager, and Greg, general manager and salesman. Contract manufacturing also plays a key role in the success of the company, and the growth of that segment has spurred RealWheels to innovate. “We realized this was a unique opportunity to add value for our customers,” says Greg Polka. To capitalize on the opportunity, RealWheels introduced its Innovative Design Engineering Applications (IDEA) division in 2010, which led to a boost in projects from current customers and opened the door with new ones. IDEA handles custom grilles, fenderettes and specialty components, and also is responsible for projects such as Criss Angel’s custom ‘Mindfreak’ H2 Hummer and the famous collection of Chicago Blackhawks Chevrolet Camaros (as seen on this issue’s cover). To do the work, RealWheels had been using a Mazak CO2 laser-cutting machine, but by 2015 management decided it needed a faster and more efficient solution. At first the company considered a new CO2 machine, but fiber-laser technology soon caught its eye. Decision makers at RealWheels found that fiber-laser machines offered a wider range of cutting capabilities and higher cutting speeds than their CO2 counterparts, while using less consumables. In narrowing the focus to fiber laser machines, the company had strict requirements for selecting a system. For instance, RealWheels was interested in having automated features to quicken setup. “We were looking for automatic nozzle changing and automatic focus to give a quick transition when switching materials,” Cory Polka explains. And, though 3 kW was the only power option on some systems, RealWheels preferred 4 kW to enable processing of thicker materials for its IDEA division. An advanced cutting head would also be needed to process various material gauges. Another requirement was a ball transfer. Checking off its list of requirements, RealWheels selected the Optiplex Nexus 3015 fiber laser-cutting machine from Mazak Optonics Corp., Elgin, IL. The machine, installed this past March, offers a side door for simple internal access, pallet changer to increase throughput, ball transfer to keep stainless steel scratch-free and Mazak’s multi-function torch. In the early-1980s, RealWheels started out making custom wheel covers. Wheel work, including this stainless-steel wheel-trim kit with lug-nut covers, is still a mainstay of the business. Key to the entire package are the machine’s Intelligent setup and monitoring functions. Automatic setup functions include nozzle changing, focus position, focus detection, profiler calibration and nozzle cleaning. Monitoring functions include pierce, plasma and burn detection. Together, these capabilities dramatically simplify operation and automatically adjust cutting parameters to increase the quality of parts and overall throughput, according to Mazak officials. “The new-machine buzz got our customers very excited, so excited that they started sending in drawings before the machine was installed,” says Jan Polka, noting that since the machine was placed online, orders have increased, due in part to more efficient operations that allow RealWheels to provide more competitive pricing to its customers. Another job, a wheel cover, had taken 11.5 min. to complete on the CO2 machine; it now takes only 1.5 min. on the new machine. A portion of these production-time reductions results from elimination of finishing steps. 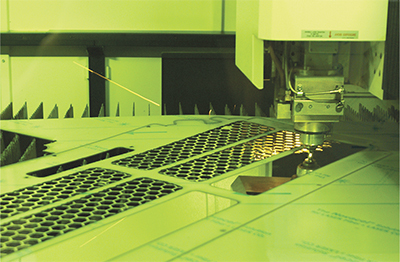 Operators can deliver laser-cut pieces directly to forming or welding operations. Article provided by Mazak Optonics Corp., Elgin, IL; tel. 847/252-4500, www.mazakoptonics.com.